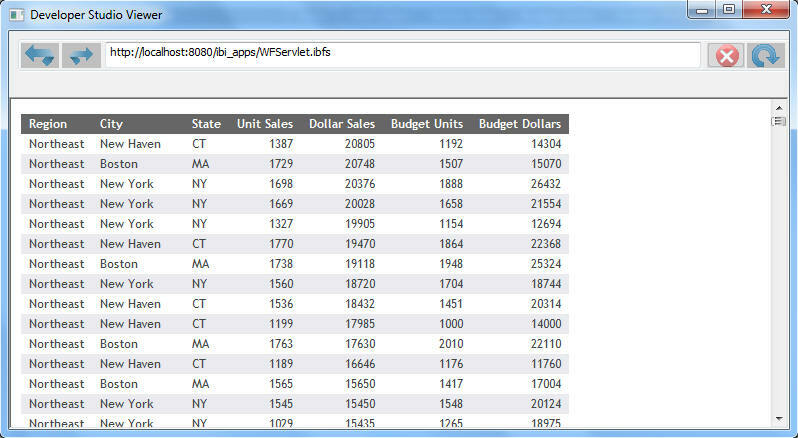 You can view HTML, PDF, and Excel reports in the Developer Studio Viewer. The following is a sample HTML report. PDF format opens in Acrobat Reader, which is invoked by the Developer Studio Viewer. Unlike HTML, which does not observe certain styling options, PDF format shows all styles as you define them in Report Painter or in a report request. The full range of Acrobat Reader navigation options are available through the Developer Studio Viewer. The following image shows a report in PDF format. The following image shows an example of a report in Excel 2000 format. When the report is run, Excel 2000 launches within your viewer, offering complete Excel 2000 functionality.